Lucky Lager is a beer themed game, designed by Cryptologic. The beer theme is unmistakable, even the title mentioning it. In case you’re not a beer drinker, a lager is actually a beer variety. It can be dark, amber, golden or pale, and it’s a favorite for a lot of people. It’s a crisper drink than an ale and it tastes cleaner, instead of having a fruity taste like an ale will usually be. To give you an example of a lager beer, I’ll just mention brands like Heineken, Budweiser or Carlsberg. 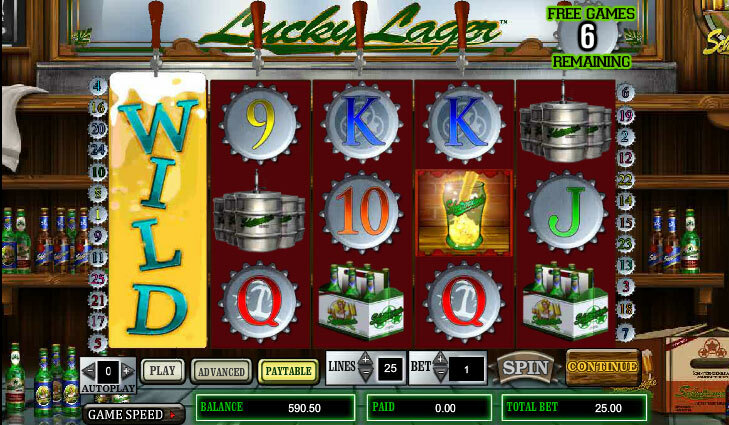 5 reels are present in Lucky Lager, a game with as many as 25 paylines active. 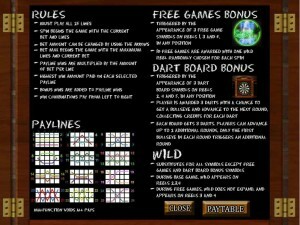 Wilds, bonus features, scatters and free spins will entertain you along the way, while you try to win the $7,500 top jackpot. 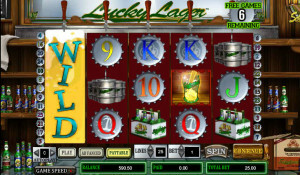 While playing Lucky Lager, you will get access to wild symbols which expand in the base game, to bonus games and to free spins which have randomly chosen wild reels. The wild symbol is the one with the glass of beer on it. 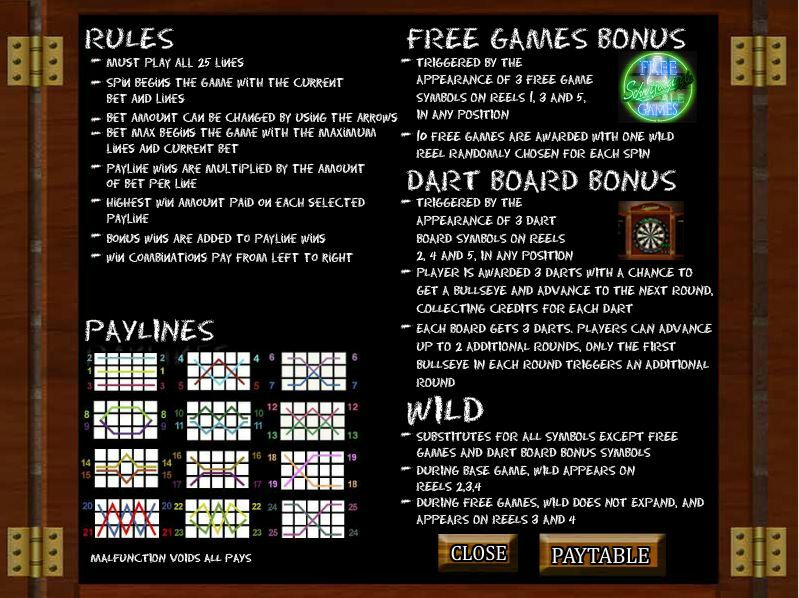 This is an expanding wild, taking over the entire reel when it appears, and hopefully helping you to get a lot more paying combinations formed as you continue playing the slot. It’s a symbol that you get on the middle three reels (2, 3 and 4). The symbols which the wild substitutes for don’t include the scatter and bonus symbols. The symbol with the Free Games Sign will be seen on the 1st, 3rd and 5th reels. You need three of these symbols, in whatever position they happen to land in, and you get 10 free spins as a reward. Each round gets one wild reel, chosen at random each time. Regular wild symbols appear in this feature as well, on the 3rd and 4th reels, without expanding like they do in the base game. 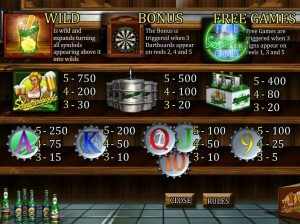 The final feature would be the bonus game, centered around a popular past time in pubs around the world. It’s a game of darts, started with three Dart Board scatters present on the 2nd, 4th and 5th reels during the same round. You receive three darts and you have a chance to hit the bulls eye, which will advance you to the next level. Each dart you throw will bring you a prize. Each level you go through brings you another three darts. You can advance this way twice, but you need a bulls eye on the first throw in order to achieve this. You don’t have the option to change the number of bet lines, they’re fixed at 25 with the arrows grayed out, but you can work on the denomination which basically decides the line bet. It goes from $0.01 to $10, and the line bet has the same range. The slot’s top wager is $250. The game has a best paying symbol which awards 750x the line bet, which means $7,500 with the largest denomination used. While I hesitate to say anything negative about a slot machine that’s themed around beer, I’m not a huge fan of the way the design was handled. The theme I’m OK with, I just wanted something better from it. It looks like a low resolution slot machine, with a dated look that doesn’t stand up to the graphics that you see in titles released these days. Still, for a fan of beer this is one of the slots to play, with some cool features introduced in it, which hopefully make up for the design’s shortcomings. 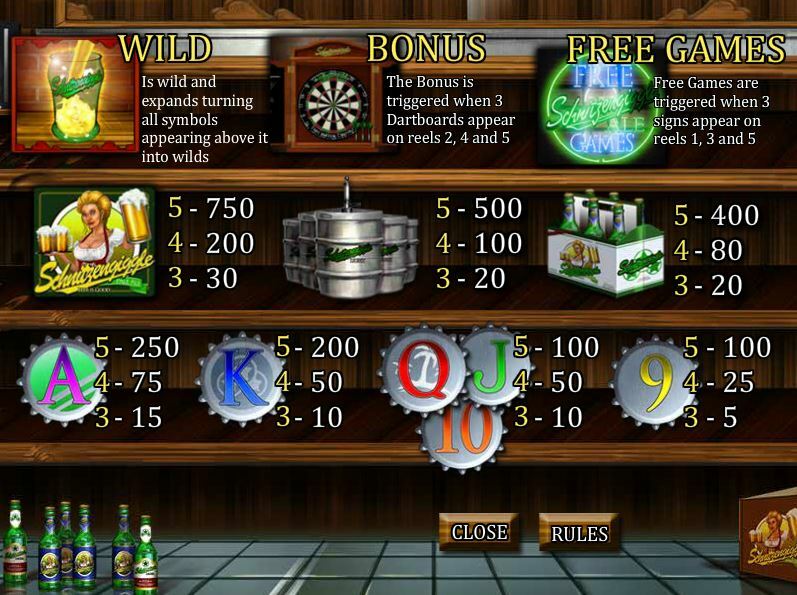 Symbols: Beer Glass (wild), Dart Board (bonus), Free Games Sign (scatter), Beer Maiden (750x), Kegs (500x), Beer Bottles (400x), Ace Cap (250x), King Cap (200x), Queen Cap (100x), Jack Cap (100x), 10 Cap (100x) and 9 Cap (100x). Beer drinkers everywhere will enjoy giving Lucky Lager a chance, and hopefully it will be as lucky as the title says. It’s not the kind of game that offers big prizes though, and that will keep a lot of players away. 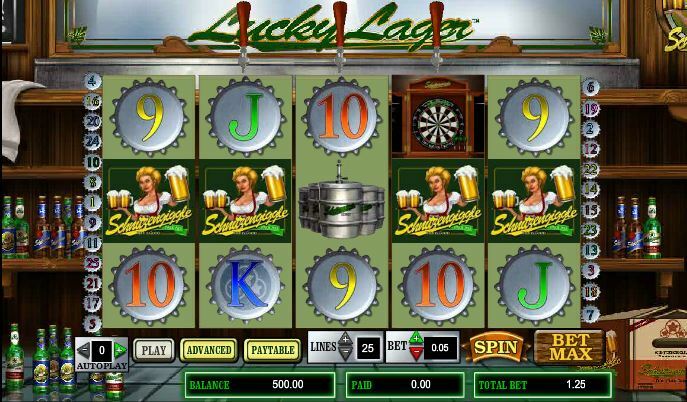 This Lucky Lager slot is offered by all online casinos with Cryptologic software, playable either in practice or in real money mode.